T-Mobile’s made no secret of the fact that its building up a strong, and fast LTE network. And quickly. That was made clear when it announced that it had gone from 0 to 220 million people covered within the first twelve months of the network going live. ” I am pleased to announce the launch of LTE 15 by 15 service in our market. Offering even greater data speeds, LTE 15 by 15 is the next step in evolution of our 4G/LTE network. By expanding the bandwidth available to LTE capable handsets, our customers will be able to enjoy even faster data speeds on TMO network. If you were wondering why suddenly your data service appears faster, it is because of this network upgrade. In addition, since the beginning of the year we have been pushing out aggressively our LTE foot print boundaries and now cover more customers than ever before. Providing the fastest network and reaching more people and places with LTE service are key objectives for us. We will continue to execute on that strategy as we go through the current year. Let us know if you see a sudden speed bump in your area, as it could also mean an improvement in network quality. 31.57 down in Lakeville (about 30 miles south of Minneapolis)….still only 1.76 up though. Is there anywhere that lists LTE by city and what form of it they have? ie. 5+5, 15+15, etc. Which band is in use would also be interesting. I want to know this too. Even when I’m outside, I only get about 8 to 10mb down and around 5mb up on my Nexus 5 through LTE. HSPA gives me 15 to 20mb in my apartment right now. As far as I’m aware TMO is only deploying LTE on band 4 as of now. I think you misunderstood what I meant. As of now, they are only deploying on band 4 and readying the PCS band for LTE. But I would like a more visible representation of the progress. I think Cam had mentioned something like this in the weeks past, though I could be mistaken. Ooooooh. Now that makes more sense. I wonder if the people at airportal[. ]de would do anything like that. if you can get into field test mode or debugging you might be able to see it…. I’m trying on a Nexus 5, i can get into the modes with an app off the playstore but haven’t seen any indicator showing what form…. Maybe google you device name and field test mode but be careful and DO NOT CHANGE ANY SETTING UNLESS YOUR SURE OF WHAT YOUR DOING…..
45.48 down and 14.29 up in Brooklyn Center (10 miles north of downtown Minneapolis. Remember those speeds will vary based on network traffic. That’s a huge one we forget about in the big cities. 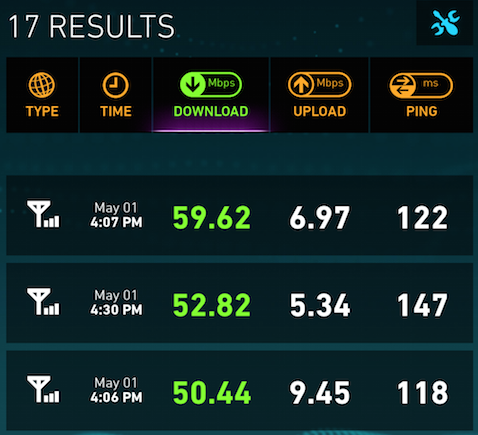 In Springfield, MO (small population) on LTE I get 20+Mb downloads, but when visiting Chicago get 5-10Mb downloads. It’s all relative. 46.14 down and 18.57 up in Golden Valley, about 8 miles west of Minneapolis. Just got similar results in Minnetonka, near 394 and 169. Holy cow. With what phone, out of curiosity? Interesting. I wonder if there’s more backhaul / fewer users further southwest from me, or if my Nexus 5 being a Cat 3 device is holding me back some. I just tried the same area with my galaxy s3 lte version and I got 66 down and 8 up. So its most likely based on users/backhaul. Your phone should be just fine. The 46ish you got is nothing really to scoff at. Want faster LTE in east dallas please!!! Please, take 30 minutes and get the forum going again, for the sake of everyone. Or at least tell is why it’s being avoided. I was actually an admin on the forum just before David left the site. I recommended building a forum from scratch, due to the sheer amount of spam (or just clearing out the MySQL DB). It would’ve taken less than 30 minutes. He even went as far as getting TmoForums (DOT) com that TmoNews would integrate with. Then all of that changed, of course. Since then, no interest has been made from anyone in regard to the forum. The community is here and willing to help. We’ve discussed it. Right now, we don’t have the man-power to maintain it. That could change in the future, because a forum could be great. I just don’t want to start one up and it end up being terrible because there’s no one to give it the time/effort/attention it needs. Understandable. I’d bet that several people here (as the comments are generally very active) who wouldn’t mind taking the role of moderators. 31.23 mbps down, 12.65 mbps up, ping 34ms in Northbrook Illinois! I got 59Mb the other day in front of the Coral Gables train station in Miami, FL the other day. Does this mean they are introducing 15×15??? Miami is still 10×10 MHz. How bout some 15×15 here in Waterbury, Ct dang it! It’s actually 2mo’s, July 1, and I would guess likely, question is how soon after July 1? Surely can’t be too long, same here in New England. So I am very much looking forward to those 60+mbps speeds. Hey! How bout some 15×15 here in Waterbury,Ct?!?!? WOW. 69.01 down and 14.68 up on the University of Minnesota campus. WOW! Any updates on San Jose and South Bay area? Any south bay or bay area folks here? I’m in Columbus, Oh and received the following text msg this morning from T-Mobile: “We’re upgrading your area to super fast 4G LTE. You may experience some service disruptions over the next 3 wks.” Usually average around 25 down, 8 up now. Excellent, I’ll definitely keep an eye out. I get about the same, between 25-30 down on the southeast side of Columbus. I got this text too. I’m in Porterville, CA. Relatively small town. I’ve been picking up LTE here and there for about a month and a half now though. Last speedtest I took I got 25 down and 11 up. I haven’t noticed at home but 20/5 is good enough…. Why are the ping times in article so high? I normally get 50ms or less…..
Orlando is a 15×15 MHz market. I’ve gotten 78 down on an iPhone 5S. “Tampa, FL” in the image is the location of the server. 46.63 down and 15.47 up in Columbus, OH. 75 down, 12 up. Midtown Atlanta. Minneapolis, MN by Lake Nokomis. 69.68Mbps down/17.46Mbps up. Great to see them enhancing their network so greatly. I wonder if it is in NYC also. About 2.5 weeks ago I got 55.25 down and 20.16 up. In Addison I get 20+20 speeds. 64/22 Pretty frequently. I wonder what they using in los angeles zip 90022? I seen speeds up to 59 dwn 15 up on my lg g2 and sisters xperia z1s ..
Im getting 58 down in Miami on an s3 lte. Perhaps if i had a newer phone it’d be even faster. Are you sure your gs3 is the LTE model? what I mean is that I have the HSPA model not LTE..so I don’t get LTE love regardless.. T-Mobile has two GS3 models…after February 2013, they started offering the LTE model…. Are there any maps that show which areas are 10by10 or 15 by 15 etc? Great. Now just need more than just Edge Network for the rest of the state. here in laredo texas troubles reaches 5 mbps upload and 1mbps down. Just saw my speeds hit 55 down in northern Illinois. I’m just outside of downtown Minneapolis (U of M area), and I’m still getting around 30mbit (10+10 LTE) download speeds.